We turn next to another of our original life history questions -are there patterns linking particular types of life history to particular types of habitat? To address this question, we introduce two further concepts. We do so in the context of the cost of reproduction, since the trade-offs associated with it are the most fundamental - but the same principles apply to any trade-off. An options set describes the whole range of combinations of two life history traits that an organism is capable of exhibiting. Hence, it reflects the organism's underlying physiology. Here, for purposes of illustration, we use present reproduction, mx, and growth (as a potentially important indicator of RRV) (Figure 4.24). The options set therefore describes, for any given level of present reproduction, the range of growth increments that the organism can achieve, and for any given growth increment, the range of levels of present reproduction that the organism can achieve. The outer boundary of the options set represents the trade-off curve. For any point on that boundary, the organism can only increase mx by making a compensatory reduction in growth and vice versa. can only be achieved with a level of present reproduction considerably less than the maximum. A fitness contour, then, is a line joining, in this case, combinations of mx and growth for which fitness (reproductive value) is constant (Figure 4.24c). Contours further away from the origin therefore represent combinations with greater fitness. 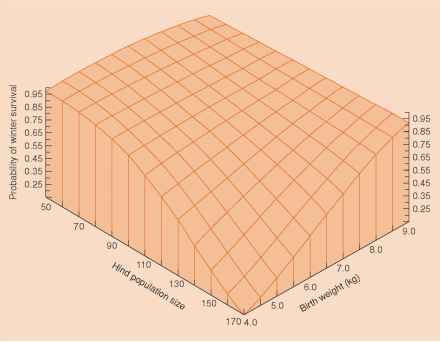 As described below, the shapes of fitness contours reflect not the organism's intrinsic properties but the habitat in which it lives. The combination of traits, amongst those available, that has the highest fitness determines the direction of natural selection. 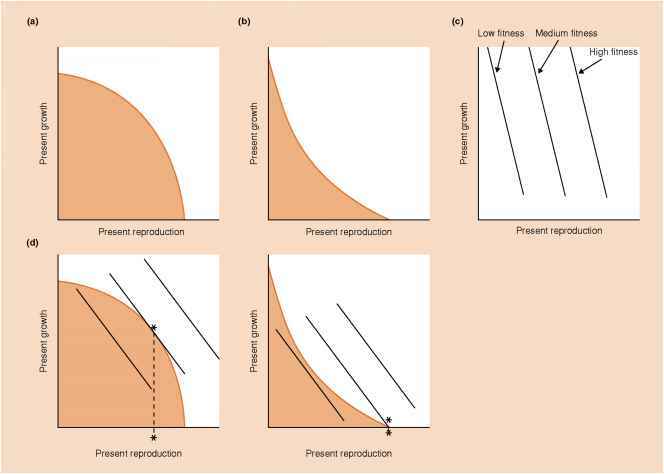 Natural selection therefore favors the point in the options set (on the trade-off curve) that reaches the highest fitness contour (indicated by the asterisks in Figure 4.24d, e). Since different options sets imply different types of organism, and different shapes of fitness contour imply different types of habitat, they can be used together as a guide to where and when different types of life history might be found.